Erika Zambello is a self-proclaimed ’new birder,’ still equally excited by Robins, Blue Jays, Mergansers, and Flamingos alike. She has lived in Maine, California, France, New York, and currently makes her home in Virginia Beach Always bringing her camera along, Erika is building her life-list by trying to check off at least one new species each week in her field guide. She’s previously written on 10,000 Birds about birding in the Washington DC cherry blossoms and weddings and birds. I was becoming frustrated. It was mid-summer in the northern woods of Maine, and any time I went birding every call and every song I heard seemed to come from the very highest of treetops, far beyond my range of vision. They were there, but I couldn’t see them. I had been birding for two days with little luck, and needed to change my tactical maneuvering. I was vacationing on Kennebago Lake, where my family has been coming every summer for nearly twenty years. 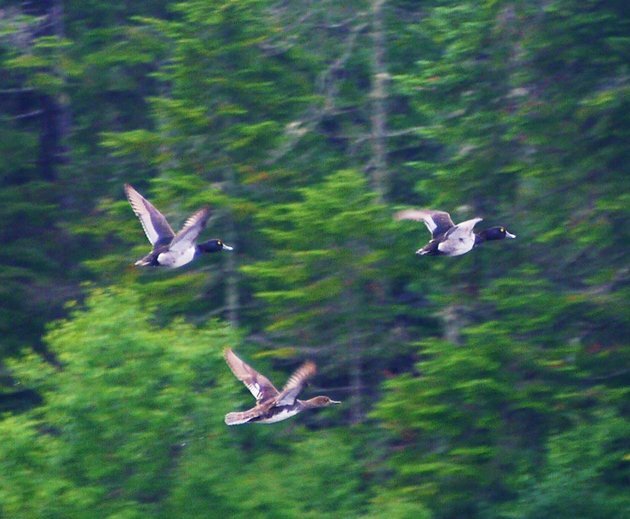 I had been birding from the dirt road that connects the few cottages and camps, the mosquitoes too grisly attempt the woods while the weather was still damp and cloudy. Even on the road I felt that the little bugs were trying to carry me away and swallow me whole. The tires of my bike were flat, so that was out. What to try? The answer came in the form of my shiny yellow lake kayak. If I couldn’t bird from land, at least I could try from the water. My mother and I slipped into our kayaks one morning, facing calm waters and a cloudy sky. Paddling away, we headed towards one end of the lake, where the water was shallower and the shores were rimmed with bushes, short trees, and bright green reeds and cattails. I didn’t really know what to expect. My kayaking adventures thus far had been before my interest in birding, and I had honestly paid little attention to anything less obvious than the Common Loons that dotted the lake. I was in for a very, very pleasant surprise. Kayaking is an amazing way to bird. We had barely been on the water ten minutes when we heard a myriad of bird calls coming from some low trees at the edge of the water. 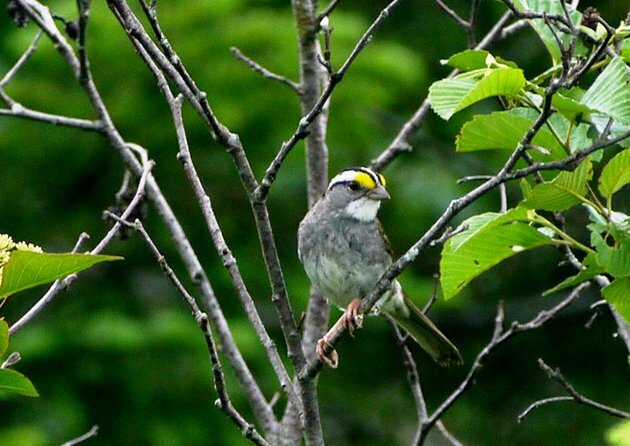 Not impeded by branches or the need to bushwhack, we could paddle right up close to the sound, in this case the merry singing of a White-throated Sparrow. Apparently our bright yellow and red (my mother had chosen an equally bright red kayak) forms were nonthreatening when approaching from the water, and the birds were wholly uninterested in our presence. We watched the sparrows bounce back and forth before being distracted by a familiar witchety-witchety-witchety call further down the bank. 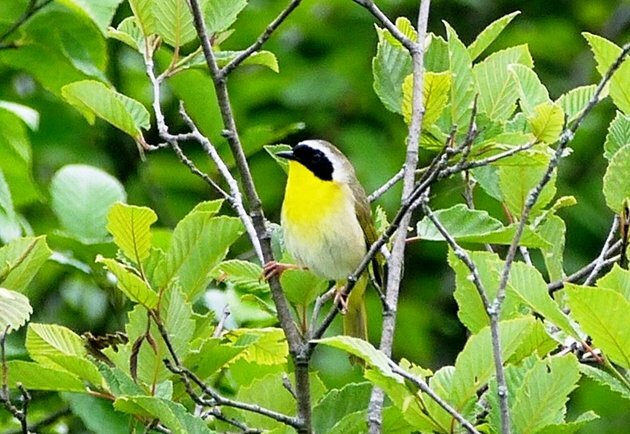 I say a familiar call, but so far I had been unable to actually see a Common Yellowthroat, as the calls tended to come from the top of the canopy or deep in the underbrush. I could pace back and forth, hands on my hips, pshh-pshh-psshhh-ing until I was blue in the face, but the yellowthroats did not descend. Yet, here he was, his face awash in black while his body shined the brightest of yellows. Hopping at the edge of the water, we had an amazing view of the warbler before he flew farther back into the leaves. He even matched my kayak! Already impressed with our views so far (both life birds for me), we paddled farther into the shallows, right at the iris edge of the lake. 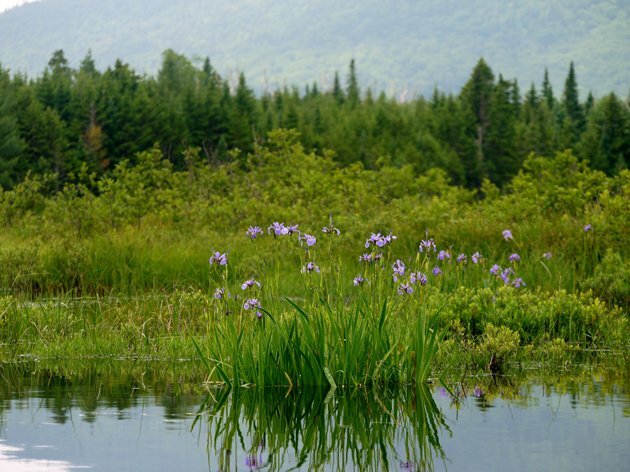 The purple irises were almost iridescent as they grew on any earthen clump slightly out of the water, glowing purple as the sun began to skirt the clouds overhead. As we continued the small leafy trees and bushes gave way to packed earth and tall fir trees, stretching their limbs out over the water. In the shadows at the base of one of the pines we saw a flash of yellow. Another Common Yellowthroat? 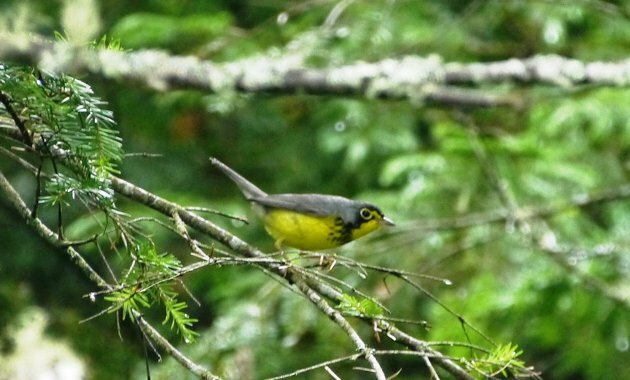 No, this bird had a dark back and distinctive black necklace on his yellow breast – a Canada Warbler and another new bird for me! Turning into the reeds, we continued looking for waterfowl, warblers, and other land birds. The Red-winged Blackbirds were abundant, both the black males and the brown females. To me their calls always sound pretty at the beginning, then turn jarring and jangling at the end. And they call frequently! As we turned a corner in one of the reed channels, we spooked a group of Ring-necked Ducks, the male’s yellow eyes glowing even under the clouds. It was positively sunny by the time we turned and headed for home. A Belted Kingfisher dove from its perch and clattered away, scanning the calm water for fish. A Common Loon floated by, unperturbed by any of the boat motors and keeping an eye out for fishermen (they routinely steal fish). A Common Merganser female, though without any young, was diving along the shore. It had been an incredibly successful morning. Birding from a kayak was beneficial in two ways: first of all, we escaped the horrible, painful, blood-sucking horde of mosquitoes and black flies that are a fact of life on damp mid-summer days (they are mercifully gone by August). It is much easier to bird when you don’t have to continually swat at your unprotected face and extremities. Second, as the trees and bushes faces the water, it’s easier to pick out birds moving among the leaves. The birds were so beautiful and bright, it seems impossible that until this year I had no idea most of them also spent their summers in Maine. I am looking forward to continuing to bird from kayaks, on other lakes and also in the salt-water marshes where seabirds are abundant. In my opinion, the more ways to bird the better! Looks like a beautiful place to kayak. Maine is one of the few states, I’ve yet to visit. We have kayaked the Wekiva river in Florida and paddled from Lake Argyle back to Kununurra-3 days-in Western Australia and both were excellent for birding. Birds really don’t see you as a threat at all. I’ll chime in too, having birded by kayak for the first time at this year’s Spring Wings birding festival in Fallon, Nevada. It really is amazing to be able to get up so close to birds at the water’s edge; that’s the best look I’ve ever had at a Marsh Wren. Plus it’s peaceful too, and less work than walking with a pack on your back!